Klamath tribal members and activists, Taylor Tupper and Ka’ila Farrell-Smith, at the compressor station in Malin, OR. Within five minutes of being at the site, they had headaches and nosebleeds. Malin is the beginning of the Pacific Connector Pipeline, where it would meet up with the Ruby Pipeline, which passes through Nevada Paiute country. Photo credit: Alex Budd from Rising Tide. TAKE ACTION TO STOP THE PIPELINE! 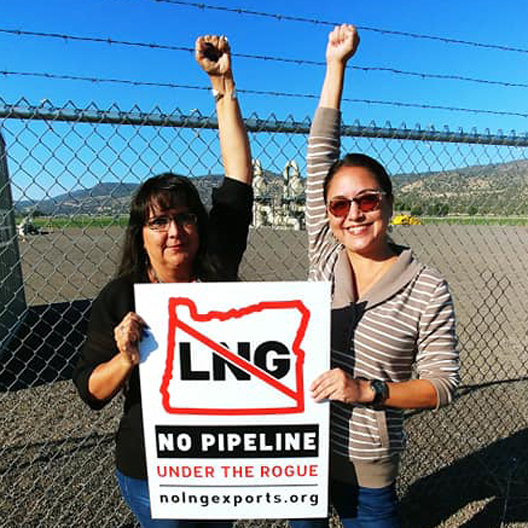 Below are direct action links for No LNG Exports, Rogue Climate, and the DSL page where people can submit public comments – which is THE most important thing we can gather at the moment. Folks have until Feb. 3rd to submit public comments to the Department of State Lands and speak personally about damage to our waterways. If you only have time for one action, click HERE to make a public comment online by FEBRUARY 3rd, 2019. Thank you! To check the status of the pipeline and read the pipeline project application on the State of Oregon website, click HERE. To visit Rogue Climate’s website about the pipeline, click HERE. This interview was recorded and produced by Molly Stinchfield and edited by Melissa Weaver.